 What is the Primary Stalk Rot Issue in Wisconsin? Anthracnose stalk rot (Fig. 1) has been a major concern for Wisconsin corn growers this season. Anthracnose stalk rot is typically worse in fields in a corn-on-corn rotation, and/or no-tilled, and planted to a susceptible hybrid. We have observed several fields with significant lodging and wind damage where anthracnose stalk rot has advanced quickly (Fig. 2). In other fields lodging has been minimal, but some anthracnose stalk rot can be found. In addition, to stalk rot anthracnose, we have also observed Fusarium stalk rot and Gibberella stalk rot. The occurrence of these stalk rots has been much less than that of anthracnose stalk rot. Why did stalk rots start so early in 2016? The late onset of northern corn leaf blight (NCLB) this season likely contributed to increased stalk rot this season. 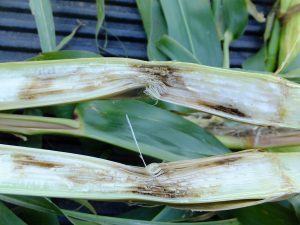 It has been documented that late season increase in leaf blight diseases, such as NCLB, can cause increased stress that leads to higher levels of stalk rot. Also, ears were large and yield potential appeared high this season. These large yield potentials may have led to increased scavenging of resources from stalks leading to more stalk stress. These stress issues, combined with excessively moist and mild conditions, likely led to the occurrence of higher levels of stalk rot in 2016. What should I do if I have a field with stalk rot? 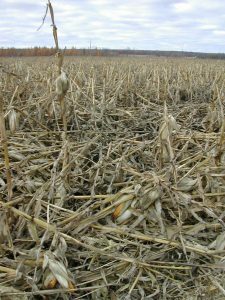 In fields were stalk rot is an issue, harvest as early as possible to avoid yield losses from lodging. Delaying harvest will increase the likelihood of lodging which will increase harvesting issues. 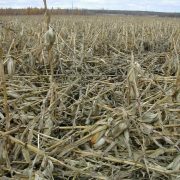 Once conditions dry enough to allow combines to run, fields with higher levels of stalk rot and/or lodging should be prioritized for harvest. What should I do about stalk rot for next season? Management of anthracnose stalk rot (and for any of the stalk rots) is multi-faceted. First, choose hybrids with the best resistance available. Hybrids that also have good resistance to foliar diseases will also offer an advantage when managing stalk rot, as foliar disease can stress corn plants and lead to increased risk of anthracnose stalk rot. Cultural practices such as crop rotation and tillage to manage surface residue can also help. Other practices that reduce plant stress such as balanced fertilization, proper planting population, providing suitable drainage, and using well adapted hybrids for your location will reduce the risk of anthracnose stalk rot. What corn ear rots and mycotoxins should I watch out for? Figure 3. Moldy growth on a corn ear caused by the Diplodia ear rot fungus. With all the wet weather late in the 2016 season, several ear rots have appeared in corn around much of the state. Ear rots caused by fungi in the groups Diplodia (Fig. 3), Fusarium, and Gibberella (Fig. 4) will be the most likely candidates to watch for as you begin harvest. Fusarium and Giberrella are typically the most common fungi on corn ears in Wisconsin. This group of fungi not only damage kernels on ears, but can also produce toxins called mycotoxins. These toxins (fumonisins and vomitoxin) can threaten livestock that are fed contaminated grain. Thus grain buyers actively test for mycotoxins in corn grain to monitor mycotoxin levels to be sure they are not above certain action levels established by the U.S. Food and Drug Administration (FDA). Figure 4. Symptoms and signs of Gibberella ear rot of corn. Diplodia ear rot (Fig. 5) is not as common in Wisconsin. However, the weather pattern this season was favorable for occurrence of this disease. This disease is often more severe in years where dry weather precedes silking, followed by wet weather immediately after silking. Diplodia ear rot does not produce mycotoxins. While this disease does not result in mycotoxin accumulation, it can cause grain yield loss and quality issues. Figure 5. Signs and symptoms of the Diplodia ear rot fungus inside a split corn ear. If substantial portions of fields appear to be contaminated with mold, it does not mean that mycotoxins are present and vice versa. Remember, Diplodia ear rot does not produce mycotoxins. However, if you are unsure, then appropriate grain samples should be collected and tested by a reputable lab. 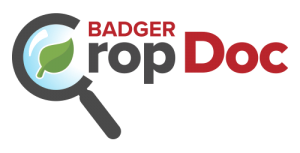 Work with your corn agronomist or local UW Extension agent to ensure proper samples are collected and to identify a reputable lab. If tests show high levels of mycotoxins in grain, that grain SHOULD NOT BE BLENDED with non-contaminated corn. As the fall is approaching and crop harvest plans are being made, it is important to continue to assess disease issues in corn and soybean. These assessments aren’t being made in order to make plans for in-field management, but to potentially improve the quality of grain that is harvested. Figure 1. Gibberella stalk rot on corn. Severe stalk rot on the left and less severe stalk rot on the right. Now is the best time to begin scouting corn for stalk rot issues and also fungal ear rot potential. Diseases such as Anthracnose stalk rot and Gibberella stalk rot are becoming apparent in corn. Inspect the stalks integrity on the outside. Be sure to squeeze the outside of the stalk to gauge the potential severity of the rot on the inside of the stalk. Cut a few stalks from diverse areas of the field to see how rotted stalks might be. In figure 1, the stalk on the left has a severe case of Gibberella stalk rot, while the stalk on the right is far less rotted. The more severely rotted stalks are, the more likely they will lodge. Therefore timely harvest is important. 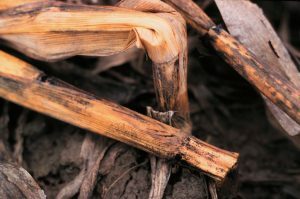 Growers should target harvest on fields with severe stalk rot before fields that have less stalk rot, in order to minimize harvest losses due to lodging. Figure 2. Diplodia ear rot. Ear rots can also be an issue at harvest time. Fusarium ear rot, Gibberella ear rot, and Diplodia ear rot (Fig. 2) are just a few that can damage corn in Wisconsin. Ear rots are becoming evident in some corn I have scouted in the last week or so. It will be critical to check fields in the next several weeks in order to make decisions on what fields to harvest first. Harvest priority should be placed on fields with a high level of ear rot. 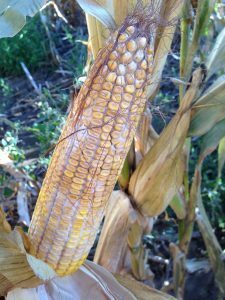 As corn stands late into the fall, certain ear rot fungi can continue to grow, damage ears, and cause increases in mycotoxins in grain. The quicker these fields dry and can be harvested, the more likely the losses due to ear rot and mycotoxin accumulation can be minimized. Figure 3. Sclerotia of the white mold fungus inside a soybean stem. In Wisconsin, the main disease to consider when making harvest plans in soybean is white mold. White mold is present in some soybean fields in the state and has caused considerable damage in a few of those fields. Remember that the white mold fungus not only causes stem blight and damage, but also causes the formation of sclerotia (fungal survival structures that look like rat droppings) on and in soybean stems (Fig. 3). These scelrotia serve as the primary source of fungal inoculum for the next soybean crop. They also get caught in combines during harvest. These sclerotia can then be spread in combines to other fields that might not be infested with the white mold fungus. Therefore, it is important to harvest non-infested soybean fields first, followed by white mold-infested fields, to be sure the combine does not deposit any residual sclerotia in the non-infested fields. If this is not an option and you must harvest white mold infested fields before non-infested fields, be sure to clean the combine between fields. For more information about white mold management in soybean you can click here and scroll down to “white mold” or watch a video by clicking here.